This test letter had a 0.44% higher response to their low dollar donors; and a 0.11% higher response to their regular/lower dollar donors. They exceeded their fundraising goals for this letter. This is a fundraising appeal letter to their house file and it was a "test." The theme was All Souls’ Day. The letter included an interactive device temporarily stuck to the upper right corner. It was a Mass card with a section to mail back to Catholic Relief Services so the donor's prayer intentions could be included in a special Mass. The “All Souls” appeal is a traditional mailing to Catholic Relief Services’ house. CRS wanted to test copy with more emotion. For two large segments of their file it performed better than the control and they exceeded their fundraising goal. Mass card is an involvement device. Donor keeps the half with the color stained glass image and a prayer is on the reverse side. The other half of the card is where donors write names of departed loved ones to be remembered in a special All Souls Day Mass at St. Stephen’s Chapel at CRS world headquarters in Baltimore. 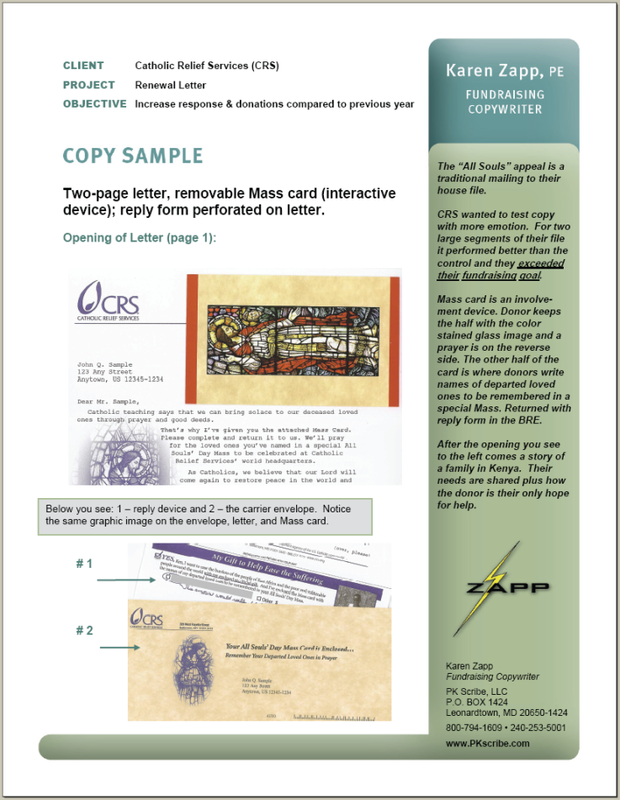 Donors return the Mass card with the reply form in the BRE. After the opening you see to the left comes a story of a family in Kenya. Their needs are shared plus how the donor is their only hope for help.